Case 02: G36 in Mexico (Long version) - rib-stardusts Webseite! Between 2006 and 2009 leading officials at the largest German exporter of small arms Heckler & Koch were involved in 12 shipments of more than 4700 G36-Assaultrifles and related materials to Mexico. At least six H&K employees – among them two former CEOs – were aware of the weapons’ illegal transportation into the Mexican provinces of Chiapas, Chihuahua, Jalisco and Guerrero, where a cruel drug war is raging. In 2010 the peace activist and author Jürgen Grässlin pressed criminal charges against leading H&K employees. In 2012 his lawyer Holger Rothbauer added charges against officials in the Federal Office for Economic Affairs and Export Control as well as in the Federal Office for Economic Affairs, who are also responsible. Regardless of the evidence, the District Attorney’s office shelved the investigation against the government officials only one month later (October/November 2012). Who Sanctions Arms Exports in Germany? The BSR is a cabinet committee responsible for the coordination and control of security policy. It sits in the Federal Chancellery (Bundeskanzleramt). The Federal Chancellor presides over the committee, since 2005 that has been Angela Merkel. The BSR is the highest authority deciding on the export of arms in especially sensitive cases - ordinarily this means exports in non-NATO, non-NATO associated or non-EU countries, so called “third countries” (“Drittländer”). The eight ministerial offices involved examine in an agreed-upon process whether all requirements for the permission of an export deal are met. All applications must be checked for compliance with the War Weapons Control Act, government policy for the export of war weapons and other armaments as well as the common position of the European Union. All meetings of the BSR are secret. By quantity of applications, Heckler & Koch is the leading applicant for arms export permits from the BSR. It is important to know that a preparatory committee holds pre-discussions on the applications and then informs the members of the BSR. This committee is made up of the heads of ministerial departments from the participating ministries. This committee “discusses and coordinates the overall works on security matters and arranges the briefing of BSR members.” (2) (translation by GN-STAT). 2) In February 2004 for guns and gun parts. 3) In June 2013 for 16 submachineguns and 11 parts for rifles. 4) In March 2005 for 18 rifles with a KWL-number and 6 submachineguns. 5971 parts for rifles with a KWL-number and 103 submachineguns. 7) In November 2007 and undeclared number of rifles with a KWL-number and submachine guns; their total value was given as 10 million euros. German arms export policy falls under the jurisdiction of the Federal Ministry for Economic Affairs (2000-2005: “Federal Ministry for Economic Affairs and Labour“, 2005-2013: “Federal Ministry for Economic Affairs and Technology“). The Federal Minister for Economic Affairs (today: “Federal Minister for Economic Affairs and Energy“) is a voting member of the National Security Council and the central representative for decisions concerning arms exports to third countries such as Mexico. The BMWi is responsibly for publishing the annual “Military Equipment Export Report” (“Rüstungsexportbericht”) and recently also the corresponding interim reports. The Federal Office for Economic Affairs and Export Control (BAFA) with headquarters in the Hessian city of Eschborn (near Frankfurt) “is a superior federal authority subordinated to the Federal Ministry of Economics and Energy.” (1) Matters concerning the control of the export of arms are among its tasks in the area of foreign trade. Heckler & Koch (H&K) is made up of the listed holding H&K AG and the Heckler & Koch GmbH. It is a German Arms manufacturer with headquarters in the city of Oberndorf am Neckar where it is the largest employer with a staff of approx. 700 people. H&K was founded in December 1949 by former employees of the MAUSER-factories, Oberndorf. Today it has branch offices in the United States (Heckler & Koche Inc. in Virginia, Georgia and New Hampshire), in Great Britain (NSAF Ltd. In Nottingham) and France (Heckler & Koch France SAS in Saint-Nom-la Bretèche). Since 2002 they have been held by the H&K-investment company. H&K is currently the largest manufacturer of small arms and infantry weapons in Germany and is one of the five leading rifle and gun manufacturers worldwide. The national arms factory in the middle of Mexico-City (Ciduadela) used to be owned by the Mexican government. It was founded by president Porfirio Díaz, who was in office from 1876 to 1910. The aim was to modernize arms and the arms industry in order to provide weaponry to the military. Since 1970 the company has been producing the automatic rifle G3 with permission from Heckler & Koch. Since 1980 they have also been licensed to produce weapons of the type HK-MP55, HK-P7 HK-21, which are among those arms used by the Mexican army. The Mexican Ministry of Defense (SEDENA) thus holds a monopoly on arms production. The Fábrica de Armas y Municiones de la SEDENA says they are contributing to Mexico’s safety by producing military vehicles and modern arms. Currently armoured vehicles, tactical aroured vehicles of the type DN-11 and rifles FX-05 (Fx-005) „Xiuhcoatl“ are being built. These weapons are meant for use in urban areas. The model FX05 was manufactured with help from Germany and is used tens of thousands of times today. A criminal charge for the unlawful reproduction of FX05 was turned down by the Stuttgart district court. The Secretatría de la Defensa Nacional and the Ministry of Marine Affairs together constitute the state ministry responsible for the defense and military education of the country. The headquarters oft he Secretatría de la Defensa Nacional is located in Lomas de Sotelo in the Miguel Hidalgo district (Mexico-City). The SEDENA manages and trains army and air force personal nation wide. Their central task is to defend the integrity, independence and sovereignty of the nation. They believe it is crucial to anticipate and ward of external as well as internal threats to the execution and upholding of national goals. The office for the marketing of arms and ammunition does more than just procure arms, it also produces and gives out weaponry. According to its statutes, it is responsible for selling arms, ammunition and accessories as well as offering related services. Consequently, after receiving permission from the “Highest General Government Authority for Firearms and Control of Explosives” public and private security services, semi-public companies, the military, hobby gun owners, hunters and field workers as well as a large number of Citizens can buy arms as well as ammunition. H&K exports a diverse portfolio of weapons, among them G36-Assaultrifles and accessories to the SEDENA in Mexico-City. According to H&K the materials are being shipped to the Mexican partners since 1980. The German embassy in Mexico reports no information pointing to a misuse. The equipment with powerful weaponry is deemed to be understandable in the face of an increasing propensity for violence from the side of well equipped drug criminals. H&K launches a marketing campaign including a promotional presentation from Markus Bantle, head of LAMAR, representative of H&K in Mexico, at the SEDENA and the subordinate agency DCAM. H&K files an application for the permission to export four to six thousand G36-Assaultrifles to Mexico with the BAFA. All floodgates open for the permission of the export of small arms when the grand coalition under chancellor Angela Merkel (CDU) and vice-chancellor Franz Müntefering (SPD) takes office. In late 2005 an extensive wave of export permits are issued for the fist time in the PC-NSC for 2020 rifles with a KWL-number. The German Federal Foreign Office denies shipment to the troubled Mexican states of Chiapas, Chihuahua, Guerrero and Jalisco because of grave human rights violations in the region. They also demand a guarantee that weapons exported to other parts of the country stay in those states. The BAFA trusts Peter Beyerle to take care of legal questions concerning the H&K arms exports. An application for an export permit is submitted tot he government and approved under the condition that arms stay in the agreed upon regions. How easily the regulations put in place to guarantee weapons stay out of forbidden areas („Endverbleibserklärungen“) could be subverted is well documented in the profound research conducted by the peace researcher Otfried Nassauer and the journalist Wolf-Dieter Vogel (c.f. „Literature“). Extensive permits are issued by the PC-NSC in February for 1515 rifles with KL-Numbers, 5971 parts for rifles with KWL-number, 103 submachineguns etc. In November the PC-NSR approves the export of a non-specified number of rifles with KWL-numbers and submachine guns to Mexico. The total value is given as 10 million euros. In November 2007 Frank-Walter Steinmeier (SPD) takes over the office of vice-chancellor and with it the role of vicechair of the NSC. In this record breaking year, the German government approved export of 6667 rifles and 3336 submachineguns with a total value of 9,932,462 euros to Mexico. The war weapons end up in provinces legally approved for the import of German weapons but also four prohibited provinces of conflict. The full range of different numbers given by various organisations describing the export of small arms to Mexico has been compiled by the Peace Researcher Otfried Nassauer and can be found in his overview „Mexico’s ver(sch)wirrende Daten“ (c.f. long version). The Heckler & Koch GmbH, Oberndorf, ships more than 4700 G36-assaultrifles worth over 4.13 million euros to Mexico. The war weapons reach the four Mexican provinces of conflict Chiapas, Chihuahua, Guerrero and Jalisco without the strictly necessary permission from the German BMWI and BAFA. The given permits legally limited their presence to other Mexican states. First criminal charges are brought by Jürgen Grässlin (JG) against H&K) for the illegal export of G36-assaultrifles to Mexico and for corruption. The responsible DA is Peter Vobiller from the Stuttgart DA’s office. The DA’s office launches investigations against H&K. The last permission for the export of an undeclared number of rifles with a KWL-number and submachineguns with a combined value of 5.45 million euros is passed by the PC-NSC. These are not part of the current criminal trial. Yet, this illustrates that a few weeks after Jürgen Grässlin’s charges were filed the last transfer of small arms from Germany to Mexico was approved. Encouragingly, afterwards a ban on the export of small arms to Mexico was introduced which is still in place today. The major news magazine DER SPIEGEL publishes a report on the sale of H&K weapons to Mexico. H&K ceases to export arms to Mexico. First search of H&K offices by 20 officials from the Stuttgart DA’s office and the customs criminological office in Cologne and the seizure of documents. Second search of H&K: Approx. 300 officials search company offices in Lindenhof as well as several private apartments. It is suspected H&K may, over years, have used bribes to receive shipping orders from Mexico. H&K announces two long-time employees, Marianne B. and Axel Haas are suspected of having arranged exports into prohibited Mexican states. They are dismissed without notice. Marianne B. and Axel Haas, who had both been employed at H&K in Oberndorf for more than 30 years, challenge their termination before the Local Court Villingen-Schwenningen. A group of teaching students from Ayotzinapa hijack a bus on their way to a demonstration in Mexico-City. They are stopped and shot at by corrupt police forces who are cooperating with organised crime. Six students die, 40 are injured, 43 disappear. Because no official investigation followed parents are still searching for their children years later. Before the Freiburg Labour Court Marianne B. and Axel Haas reach a settlement with H&K. The public broadcaster ARD shows the movie “Meister des Todes” and the documentary “Tötliche Exporte. Wie das G36 nach Mexico kam” by Daniel Harrich. Four and a half million viewers see these movies on the export of German arms. Due to a repeated showing of the films on public television more than ten million viewers have by now been informed about the illegal arms deal with Mexico. Under public pressure the DA’s office Stuttgart finally charges six former H&K employees, among them are former CEOs Peter Beyerle and Joachim Meurer. In October 2016, following a complaint from AAL Rothbauer, DA Peter Vobiller formally opens an investigation into officials from the BMWi and BAFA offices. He terminates the investigation in November without an actual investigation ever taking place. Further investigations and a potential prosecution have hence become statute-barred. The team of the film producer Harrich and the expert adviser Grässlin receive the GRIMME-Award. At the same time Grässlin, Harrich and Harrich-Zandberg are investigated by the DA’s office for the alleged illegal sharing of sensitive trial information. The allegations concern files which had been handed to the DA’s office by the authors. The author had later published excerpts from theses files in print and film. The investigative journalist Thomas Reuttler reports on the illegal dealings between H&K and Mexico in the ARD political journal Report Mainz. On the same program the Green MP Hans-Christian Ströbele rightfully demands an investigation into responsible officials at the BMWi and the BAFA. More than six years after the initial filing of the criminal charges the opening of a trial against six former H&K employees is declared by the Stuttgart District Court. To former CEOs, two former marketing directors, a former staffer and a former sales representative are charged with the violation of the War Weapons Control Act and the Federal Act on Foreign Trade. They were allegedly involved in 16 cases of the illegal export of rifles and accessories to Mexico without the required permits between the years 2006 and 2009. The Munich Local Court does not accept the charges brought by the prosecution against the journalists DH and JG for the publication of files concerning a criminal trial. These charges concerned movies shown on public television and the book „Netzwerk des Todes“ (published by Heyne). While the DA Peter Vobiller iced the investigations against public officials for the illegal deal with Mexico he helped to prepare charges against the authors in Munich. Because of the legally binding decision oft he court there will not be a public trial. Main hearing in the trial against the former H&K employees Peter Beyerle, Joachim Meurer, Markus Bantle, Ingo Sahlmann, Wolfram Mackrodt and Marianne B. for the alleged violation of the War Weapons Control Act and the Federal Act on Foreign Trade before the Stuttgart District Court. The presiding judge is Frank Maurer. 25 days of trial are scheduled before the end of October. (*1959 in Rottweil) became Heckler & Koch’s sales representative in Mexico in 2003. In Mexico he managed the sales negotiations in the interest of the company. The DACAM was the exclusive customer of weaponry. Bantle may be facing a higher prison sentence than Beyerle as he is charged with 16 offenses. (*1963 in Rottweil) Marianne B., staff member of the marketing department and the sales director Axel Haas were branded as the primary scape-goats for the Mexico-deal by their company. Both were dismissed. Both successfully objected to their termination before the Labour Court Villingen-Schwenningen. Beginning in May 2018, Marianne B. is going to be on trial as the person responsible for Mexico at H&K. Haas passed away on September 3rd, 2015. (*1940 in Tübingen) In November 2005 Peter Beyerle reached the age limit on the office of chief justice in Rottweil and retired from the position after seven years in office. Heckler & Koch is headquartered in the Rottweil region. In early 2006 Beyerle transitioned into the management level of the Heckler & Koch GmbH as their Agency Correspondent; Starting in the summer of 2007 he also became responsible for exports and CEO of the Heckler & Koch GmbH. In this capacity he played a major role in the illegal G36-deal with Mexico. The DA’s office in Stuttgart alleges Beyerle acted as a member of a „gang“ („Mitglied einer Bande“), which was constituted for the commitment of the alleged crimes. Beyerle is accused of having committed 12 legally independent actions in which he intentionally exported war weapons without obtaining a permit. In doing so he allegedly violated the War Weapons Control Act and the Federal Act on Foreign Trade. If the trial runs as expected Beyerle should be facing a long prison sentence. Literature tip: C.f. 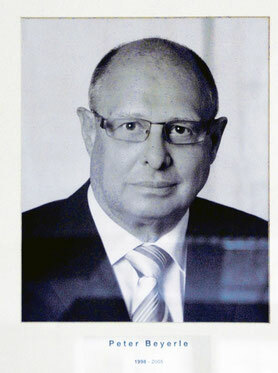 the Offender’s Profile „Peter Beyerle – Chief Justice turned Armsdealer“ in the book Schwarzbuch Waffenhandel. Wie Deutschland am Krieg verdient, p. 463 ff. (*1948 in Erfurt) Mackroth was marketing director at H&K from 2008. He is charged with a smaller number of accounts of negligence concerning the export of war weapons without permission. (*1958 in Lahr) Meurer came to Heckler & Koch from the Hermann Meurer Administration-GmbH in Lahr in the black-forest. In the beginning of September 2005, he was called as one of the CEOs of the H&K GmbH where he was responsible for exports until July 2007 and served as CEO until August of 2007. During Meurer’s tenure the most war weapon exports to Mexico were approved. Consequently, Meurer, like Peter Beyerle, is charged with the illegal transfer of war weapons as a member of a „gang“ in 12 cases. His actions allegedly violated both the War Weapons Control Act as well as the Federal Act on Foreign Trade. In the meantime, he has become the CEO of the Gebrüder Meurer Administrationcompany m.b.H. (*1962 in Essen) Sahlmann was the head of the H&K marketing department for more than four years (from early 2003 until early 2008). As with Meurer, his tenure too saw the most extensive export deals with Mexico. Allegedly, Sahlmann intentionally and illegally exported war weapons over an extended period of time as a member of a “gang”. Wolfram Mackroth took his position in January 2008. Angela Merkel has been chancellor of Germany since 2005 and has thus been the chair oft he national security council in that time period. In secret sessions the NSC decides on the approval or denial of especially contagious war weapons exports into regions of war and conflict, to states at war and states violating human rights. The chief exporter here is Heckler & Koch - the company from Oberndorf receives the leading number of permits. As chair of the NSC Merkel bares responsibility for the export of at least 8700 assault rifles to Mexico (this number is likely larger in reality). She is thus co-responsible for the murders committed over years with H&K-weapons in conflict-ridden Mexico. Angela Merkel has been the chief offender of German weapons export politics since WW2 (c.f. the comprehensive Offender’s profile „Angela Merkel – Marketenderin der Todeswaffen“ in Schwarzbuch Waffenhandel, p. 176 ff.). The largest wave of permits for the export of rifles listed as war weapons issued by the National Security Council and their Preparatory Committee happened during the tenure of this CSU-politician. The extensive arms exports begin in 2006 with the export of 2025 rifles. As minister responsible for the export of arms and member of the NSC, Glos is co-responsible for the export of thousands of G36-rifles to Mexico and the deadly effect of the weapons there. Offenders in the Ministry for Economic Affairs (BWMi) and in the Federal Agency for Export Control (BAFA)? The “triad of death“ includes offenders from H&K as well as the BWMi an the BAFA. The close collaboration in the triumvirate enabled the export of thousands of G36-rifles into Mexican regions of conflict. The book Netzwerk des Todes. Die kriminellen Verflechtungen von Waffenindustrie und Behörden documents just how closely the BWMi and BAFA collaborated for the benefit of H&K (c.f. “Literature”). To name only one example: The correspondence between a case worker at BAFA and a Director ad the BMWi makes apparent that an extra piece of legislation, a „LEX Heckler und Koch“ was created for the purpose. Arms manufacturers are usually allowed to ship an extra of 10% in replacement parts and accessories on top of the initial shipment. This volume is binding - the sole exception is H&K: BAFA and BMWi agreed on a highly unusual special legislative arrangement which allowed H&K to ship an extra 30% to Mexico (c.f. Netzwerk des Todes, p. 209 ff.). Starting in May 2018, despite the evidence, no BMWi or BAFA official can be tried. This is due to the actions of the Stuttgart DA Peter Vobiller. In November 2012 he did not act upon charges brought by the lawyer Holger Rothbauer who formally complained in October 2016. Consequently, Vobiller opened an investigation the same month. The investigations were closed again just one month later, in November 2016, without any real investigations having been conducted. Afterwards the statute of limitations began which renders new investigations and a possible criminal trial against the responsible agencies impossible. Hence, from the members of the „triad of death“, only former H&K employees are now facing trial in Stuttgart. This raises questions over the fairness of the trial as the seats of BAFA and BMWi officials remain vacant! (*1945 in Mérida, Yucatán, Mexico). [#LF] Im Jahr 1965 absolvierte Aguilar das Heróico Colegio Militar (mexikanische Militärakademie) als Offizier der Infanterie; seine berufliche Ausbildung umfasst einen Abschluss in Militärverwaltung an der Escuela Superior de Guerra y Estudios de Pedagogía Militar im Jahr 1974. Während seiner militärischen Laufbahn bekleidete Aguilar zwischen 1962 bis 2002 verschiedene Positionen und Kommissionen innerhalb des Militärischen Instituts. Aguilar commanded several infantry brigades and battalions, i.a. in the states of Guerrero and Chiapas (two of the four regions of conflict which illegally received G36-rifles). From 1989 until 1994 he was in a managing position in the planning and education section of the SEDENA. From 1999 to 2002 he was vice-director of the administration and logistics section at the SEDENA. In the following years he held a variety of military posts. From 2007 to 2008 he was director general at the military industry (Campo Militar No. 1-D, Mexico). From 2008 until February of 2009 he served as vice-chief of the military staff for national defence. [#LF] Aguilar wurde im September 2010 aus nicht veröffentlichten Gründen vorzeitig von General de División Carlos Demetrio Gaytán Ochoa abgelöst. Die Heckler & Koch-Affäre begann sehr früh, knapp ein Jahr bevor Felipe Calderón Präsident der Republik Mexiko wurde, mit seiner Art der Kriegsführung den Drogenhandel. The Purchase of H&K-weapons by the government of 27 Mexican states happened between 2006 and 2009. Over this period at least six generals knew about and were involved in the process of choosing and purchasing high performance weaponry. They purchased arms of the types G36-V, G36KV and G36-C for a total price of more than 13 million euros from H&K. General de División Aguilar, as director of the office for the marketing of arms and ammunition (DCAM), allegedly requested and received bribes for each H&K weapon that was sold. These allegations are raised by a former Heckler & Koch employee. According to him, Aguilar received a bribe of 25 US $ for each H&K rifle that was sold and 20 US $ for each “short weapon” (e.g. a gun). The H&K representative in Mexico supposedly paid the bribes, this has, however, not yet been proven. Litrature Recommendation: C.f. „Netzwerk des Todes“,p. 87, 94 f. i.a. The Mexican police are known to use methods which violate human rights. The corruption within the police forces is a major reason for crimes to go unpunished and human rights being violated. Unlawful arrests and torture are established practices. Mexican courts admit evidence obtained under torture. Violence against women, murder of women, obductions, the murder, threatening and disappearance of journalists and human rights activists happen on a daily basis. One would think it is common sense not to sell war weapons to security forces which are involved in such grave human rights violations. Arguing that they contribute to the war against the drug-mafia countries such as Germany and the United States sell weapons to Mexico none the less. Approximately 100,000 people have died from the use of small arms (guns, submachine guns, rifles, etc.) in Mexico between 2006 and 2012. In the large majority of cases there are no investigations from Mexican officials into who the murderers were and what weapon types were used to kill the victims. On September 26th, 2014 six young people were shot at a protest of teaching students in Ayotzinapa, Guerrero, 43 additional students were kidnapped by the police. They have not been seen since, their fate is unknown. According to a report made from Mexico by the journalist Wolf-Dieter Vogel for the newspaper taz, 37 of the 200 weapons that were used in the incidence were HK G36 assault rifles. According to the agreement with the German Government these weapons should not have been allowed to be in that state. It is impossible to determine exactly how many people have been wounded or killed by illegal police actions or the drug mafia since 2006 using G36-rifles. For the victims‘ families and friends it matters very little if their relatives were murdered by organized crime or the police. Investigative journalists or photographers would not survive an investigation into the matter. Only the case of the six students who were shot and 43 who disappeared in Ayotzinapa has made international headlines. A co-production by Diwafilm, SWR and BR fort he ARD/Das Erste. For extensive descriptions of the movies c.f. long version. (* 1947 in Mexiko-City) studied at the University of Heidelberg and graduated in interpreting and translating. At the same time she worked with the charity MISEREOR on their engagement in Latin America. Afterwards she trained as a peace specialist at the Schalomdiakonat and as a mediator at the Heidelberg Institute for Mediation. A member since 2004 she is now working fort he „Werkstatt für Gewaltfreie Aktion (WfGA). She has been a member of their board for eight years and is their representative to the panel supporting the German Campaign “Aktion Aufschrei – Stoptt den Waffenhandel!”. She has been active in refugee support since 2014. (*1957 in Lörrach) is the complainant in the case against Heckler & Koch employees in the case of the illegal export of G36-assaultrifles to Mexico. He is, among other things, spokesperson for the „Aktion Aufschrei – Stoppt den Waffenhandel!“, federal spokesperson fort he German Peace Society – War Service Opponents United (DFG-VK as a member of War Resisters‘ International, wri), Chairman of the ArmsInformationCentre/RüstungsInformationsBüros (RIB e.V.) and co-founder of the “Kritische Aktionär*innen Heckler & Koch” (KAH&K). Grässlin is the author of several critical books on weapons exports, military and economical policy- among these are international bestsellers. His most recent book is the Schwarzbuch Waffenhandel. Wie Deutschland am Krieg verdient and, in collaboration with Daniel Harrich and Danuta Harrich-Zandberg co-author of “Netzwerk des Todes. Die kriminellen Verflechtungen von Waffenindustrie und Behörden” – “the” book on the G36 exports to Mexico. Grässlin has so far received ten awards for peace, civic courage, work with media and human rights. As co-author oft he book Netzwerk des Todes and his expert advice to the Harrich-Film „Meister des Todes“ he was awarded the GRIMME-Award (as a member of the Harrich-team) and the Marler Media award for human rights by Amnesty International.